Israeli forces injured 22 Palestinians during violent clashes in Sinjil village north of Ramallah on Sunday following the funeral of Muhammad Jasser Karakra, who was shot dead last Wednesday after he stabbed two Israeli soldiers. Witnesses reported a large presence of Israeli soldiers at the main entrances to Sinjil village before the funeral procession arrived from Ramallah, saying that soldiers were stationed on higher ground and that many were masked. Violent clashes later erupted and Israeli soldiers fired rubber-coated steel bullets and tear gas canisters on crowds of young men, ambulance staff and journalists. 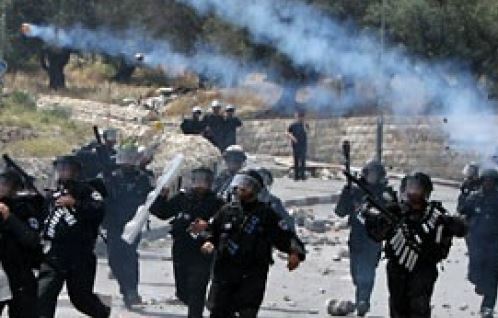 The Palestinian Red Crescent's center in Sinjil reported 22 injured, suffering rubber-coated bullets injuries and excessive tear gas inhalation. The center said they were being treated on site. Israeli authorities released Karakra's body to his family on Sunday, having held it since he was shot dead after stabbing two Israeli soldiers at the Sinjil junction near the Shilo settlement. One of the Israeli soldiers, 20, was critically injured after being stabbed in the neck. The other received minor injuries and then opened fire at Karakra, 27, who sustained critical injuries before being pronounced dead. Locals told Ma'an that Israeli forces afterwards raided several areas surrounding Ramallah including Sinjil, Turmusayya, al-Luban al-Sharqiya, and al-Luban al-Gharbiya. Around fifty Palestinians and international activists gathered today in Tulkarem, east of Nablus, to protest the presence of 11 Israeli chemical plants located in the city. The protest took place outside the Gishuri chemical plant on what is locally referred to as the “death road” due to the health problems caused by the Israeli plants. The protesters were carrying signs demanding a clean environment and an end to the Israeli occupation, while Israeli soldiers deployed to guard the plant quickly responded with stun grenades and tear gas. On one occasion Israeli soldiers fired tear gas canisters aimed directly at peaceful demonstrators and the press. As the protest continued, a 22-year old Palestinian man was shot by a rubber-coated steel bullet, hitting him in the abdomen. He was later taken to the local hospital and appeared to have suffered superficial damages only, although he was in great pain. The protest quickly subsided after this event. 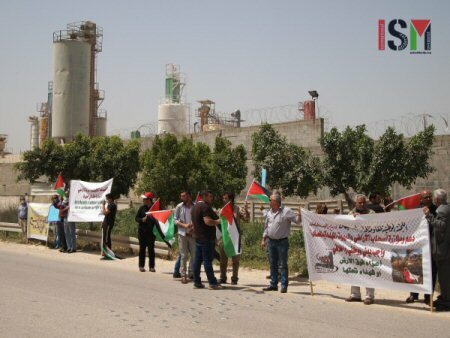 The protest against Israel’s chemical plants have been continuous since Gushiri Industries, a manufacturer of pesticides and fertilizers, first arrived in Tulkarem in the mid-1980s. The plant used to be located in the Israeli city of Netanya, only 12 kilometers away. However, a 1982 Israeli court order said the company was violating pollution regulations, making the company relocate to the West Bank’s Area C, which is under full Israeli control. The court order came after a complaint filed by Israeli citizens. Since the arrival of Gushiri Industries, ten other chemical plants have located nearby, the last one in 2007. The location of these plants have caused many local farmers to lose most of their land and contributed to unemployment and poverty in the area. Hence, many local Palestinians have been forced to work at these chemical plants, as the Israeli corporations are taking advantage of the low labor costs and the non-applicability of Israeli labor laws in Area C.
The most serious consequence of the presence of these chemical plants is the health effect on Palestinians. The air in Tulkarem has been found to contain alarmingly high rates of monoxide and toxic substances in studies by both the University of Birzeit and the Palestinian Ministry of Health. In an interview with the Middle East Monitor last year, Dr. Abed Darak of the Tulkarem Ministry of Health said the city has the highest cancer and leukemia rate in the West Bank, claiming that 20 per cent of all cases stems from the area – despite being home to only five per cent of the total West Bank population. A 2012 report from the Palestinian Ministry of Health found that 77 per cent of the cases of cancer in the city were directly linked to chemical substances from the factories. A representative from the Palestine Technical University (PTU), which neighbors the Gushiri chemical plant to the south and the Apartheid Wall to the west, said today that the smell is “unbearable” after 3 pm, which explains why most residents of Tulkarem always keep their windows shut. Residents living near the factories have also developed health issues including asthma, reduced lung capacity, skin ailments and eye infections. This is especially true for elementary students. Additionally, it has been estimated that approximately 300 dunams, i.e. 300,000 square meters, of agricultural land is contaminated by emissions from the factories. The global civic organization Avaaz is currently running a campaign named “A child’s cry: Stop poisoning Palestine’s schools” to help stopping the chemical plants in Tulkarem. By signing a petition on their website, you can help putting pressure on the EU, their biggest market, to apply their strict(er) environmental regulations and impose an import ban on these factories. A Palestinian working in Israel was assaulted in his workplace during a dispute over a "broken mobile phone screen," his father said, calling for Israeli accountability for mistreatment of Palestinian workers. 22-year-old Ahmad Nihad Abdullah, from Jenin, was working in a phone repair shop in Umm al-Fahm when he reportedly broke the screen of one a phone during the process of repair. Abdullah's father told Ma'an News Agency that the shop owner locked him inside of the store for four hours, "insanely" assaulting him. After repeatedly hitting his son on the head, he threaten to shoot him. Ahmad managed to call his father pleading for help, saying "they are going to kill me." The father contacted the Palestinian military liaison office, who in turn contacted their Israeli counterpart and managed to locate and free his son who returned to Jenin with serious bruises on his body and head. He added that his son had all the necessary paperwork to work legally in Israel, and called on human rights organizations to expose the mistreatment of Palestinian employees in Israel. Abdullah's place of work Umm al-Fahm is located in the Haifa district of Israel, around 20 km northwest of the occupied West Bank town of Jenin. The town is home to nearly 50 thousand Palestinians, many of which are treated as second class citizens of Israel facing frequent discrimination. Israeli attitudes of hostility and mistrust of Palestinian citizens of Israel have increased in recent years, as the minority is seen as a demographic threat and face socioeconomic differences from their Jewish counterparts, according to Israeli human rights organization Association for Civil Rights in Israel. Two Palestinians from east Jerusalem on Monday evening suffered injuries and bruises when Israeli soldiers brutally attacked them and their families in Bir Ayyub area in Silwan district, south of the Aqsa Mosque. The Wadi Hilweh Information Center said that the Israeli occupation forces (IOF) stormed the house of al-Khalfawi family in Bir Ayyub and severally beat the brothers Maher and Mustafa. The center added that the soldiers fired stun grenades inside the house and smashed an internal surveillance camera to cover up the assault on the young men. The center also reported that six members of an Israeli special unit chased yesterday a group of Palestinian children as they were walking in Ein Loza neighborhood in Jerusalem and indiscriminately fired stun grenades and rubber bullets in the area with no reason. At least 21 Palestinian, including minors, were taken by Israeli military and police on Tuesday, most of them during predawn raids on Palestinian towns across the occupied West Bank districts of Hebron, Ramallah and Bethlehem, according to reports by local and security sources. The army forces broke into al-Arroub refugee camp, north of Hebron, during the late night hours before abductig Abed Suleiman Titi, 14, Musa Titi, 19, Abdel-Rahman Swelem, Nadim Badawi, 18, and Hazem Ra’i, 15. Israeli soldiers also stormed the city of Hebron, according to WAFA, where they kidnapped 13-year-old Aladdine Saharawneh, and the nearby town of Dura, where they also took Yousef Masalmeh. The two were led to an unknown destination. The army further broke into other towns in the district of Hebron and set a number of checkpoints at main streets, but there were no reports of arrests. Meanwhile, army forces broke into multiple locations in Ramallah district at predawn, before abducting at least eight Palestinians. They were identified as Taha Asmar, Jamal Yasin, Abdel-Qadir Barghouti, Majdi Harb, Hammam Harb, Mosab Qasem, Hussein Aqel and Mohammad Aqel. Israeli forces also stormed the village of Rashaydeh, east of Bethlehem, where they kidnapped Majed Rashaydeh, 26, after raiding and searching his home. In the meantime, Israeli police in Jerusalem kidnapped two Palestinians in the neighborhood of Silwan. The two, identified as Foad Kak and Ali Da’na, where led to the Russian Compound detention center in the city. 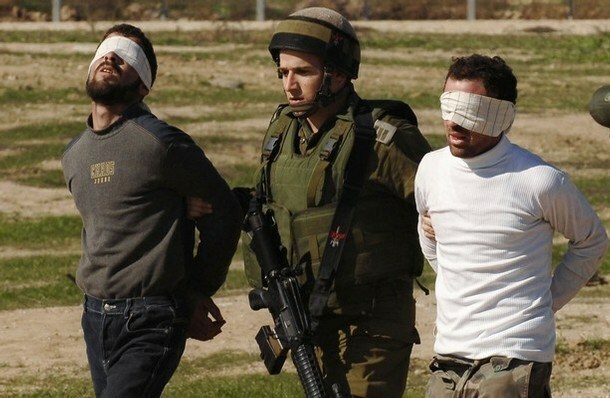 The Israeli army arrested three released prisoners from the Qalqilia governorate. They were identified as Musa Sawi, 29, Imad Ji’idi, 27 and Saleh Daod, 30. The Israeli occupation forces (IOF) at dawn Tuesday kidnapped 15 Palestinians in different areas of the West Bank. Local sources told the Palestinian Information Center (PIC) that the IOF stormed Beit Rima town, northwest of Ramallah, and raided several homes. They added that sporadic clashes took place during the campaign between young men from the town and the invading troops, who fired bullets and stun grenades. 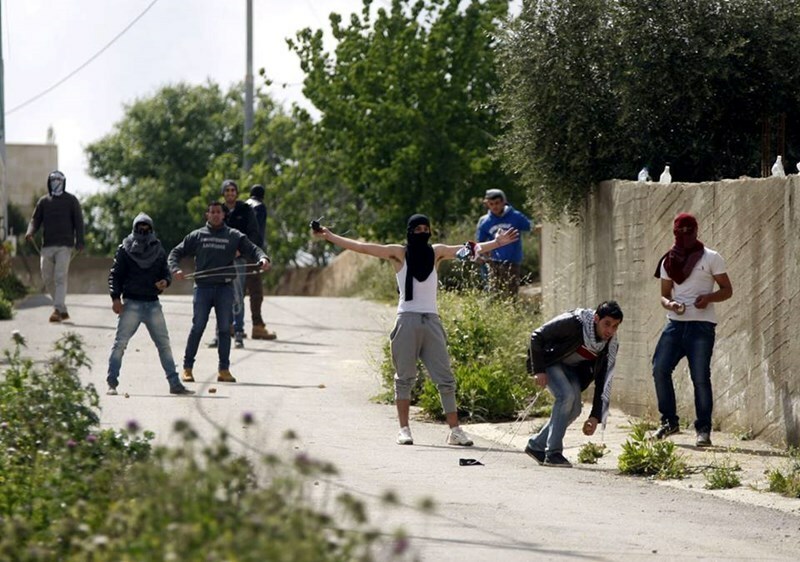 Seven young men were kidnapped from their homes during the campaign in Beit Rima. In al-Khalil, the IOF also kidnapped four kids from Aroub refugee camp. The detainees were identified as Mousa al-Titi, Nadim al-Badawi, Hazem al-Ra'ei and Abdul-Rahman Suwailem. Another four Palestinian young men were taken prisoners during IOF campaigns in the cities of Qalqiliya and Nablus. 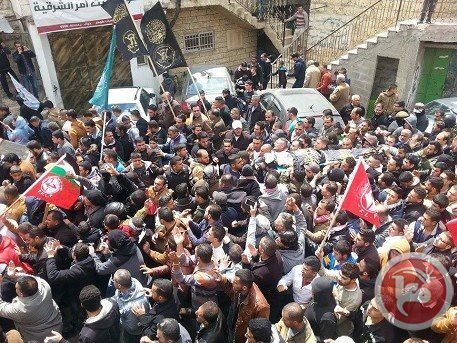 Dozens of Palestinian youths were injured during clashes that erupted at the entrance to Singel town near Ramallah following the funeral of the martyr Mohamed Karara who was shot and killed by Israeli soldiers after stabbing two of them. Medics said that most of the casualties were rubber bullet injuries, while dozens of suffocation cases were reported due to the heavy fire of tear gas bombs. Hundreds of Palestinians buried Monday the martyr Karara amid calls for taking revenge against Israeli occupation forces. His body was handed over to his family on Sunday after being held several days. Israeli soldiers, and undercover units, invaded on Monday evening the Shu’fat refugee camp, in occupied Jerusalem, and clashed with dozens of local youths. Media sources said dozens of soldiers, and members of the undercover units in addition to several Israeli security officers, invaded the camp through its main road, before clashing with local youngsters. The soldiers fired gas bombs and rubber-coated metal bullets, targeting the youths in addition to a number of homes and stores. The army also invaded a home in the camp, and confiscated a computer, before withdrawing from the area without conducting any arrests. Israeli warplanes launched mock air raids over Gaza Strip on Monday morning. 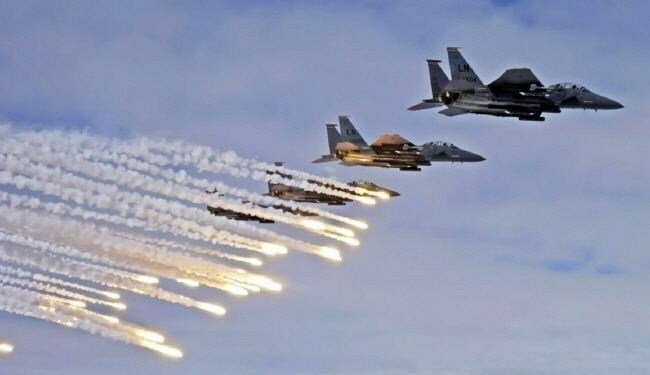 Eyewitnesses in Gaza said squadrons of Israeli F16 planes flew over the blockaded Gaza Strip and launched sudden and intense mock raids in the morning hours. Loud explosions were heard across the Strip, breaking the sound barrier and making sonic booms. A state of concern prevailed among Gazan people who feared of incoming real raids. Six protestors lightly hurt in clashes with police after officers seal off neighborhood to demolish house of resident. A general strike was declared Monday in Kafr Kanna following riots that broke out overnight after security forces demolished a home in the Arab town built without the required construction permit. Six residents, including the head of the town's local council Mujahed Awawdeh, were lightly hurt in clashes with the police. Overnight Sunday, police forces and Border Police officers sealed off the neighborhood and evacuated the home of Tariq Al-Khatib, a resident of the town. Following the evacuation, family members who were at the scene told the officers: "You destroyed the home, and we will rebuild it." Khatib said in response to the incident: "I built on land that I inherited. The state has no right to demolish the home, and even if they destroy it 100 times, I will rebuild it." He further said: "Where else can we live? We have no roof over our heads. Instead of helping the Arab citizens, the country is trying to drive us out." During the demolition, dozens of residents gathered at the scene and tried to prevent it from taking place: "Allahu Akbar," they shouted, calling the police forces "terrorists". Violent riots broke out between the two sides. The police used tear gas, stun grenades and rubber bullets to disperse the rioters. Six protestors were hurt as a result of the clashes. Following the demolition, a general strike was declared. The Nazareth police said they were ready for any disruption of order. Security forces are currently stationed at the entrance of the town in order to prevent the blocking of roads. Israeli settlers who stormed Al-Aqsa Mosque yards under Israeli police protection, on Saturday, assaulted a number of Palestinian female worshippers, according to witnesses. Witnesses said that Palestinian worshippers were attacked by settlers after attempting to fend off the former’s attempts to tour the yards of the mosque, WAFA Palestinian News & Info Agency has reported. 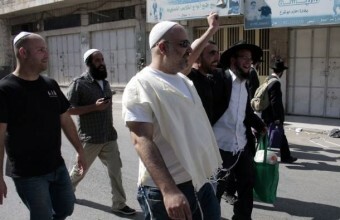 Settlers assaulted a number of women carrying copies of the Quran and used foul language against them. Israeli police impose restrictions on Palestinian worshipers’ entry, particularly women and youth. Police retains their identity cards prior to their entry in anticipation of any clashes and to be able to detain those who might be involved. The city of Jerusalem has been a scene of ongoing violent and deadly incidents which skyrocketed following Israeli settlers' murder of 17-year-old Palestinian teenager Mohammad Abu Khdeir, who was found torched to death in a wood in Jerusalem, last July. Since then, violent incidents caused loss of life on both Palestinian and Israeli sides. Also on Sunday, an Israeli settler ran over a Palestinian female near one of the gates of Al-Aqsa mosque, before fleeing the scene. The settler ran over a female, who currently remains unidentified, while she was standing at the light railway stop located near the mosque’s Bab al-Amoud gate, also known as Damascus Gate, in East Jerusalem, before fleeing the scene. She was transferred to a nearby hospital for treatment, where her medical condition remains unknown. Whereas Israel deals with Israeli cars crashing into Palestinian pedestrians as traffic accidents, it considers similar incidents by Palestinians as ‘terrorist attacks’, upon which shooting and killing orders are easily taken, depriving Palestinians of the right to a fair trial. On October 23, 2014, Israeli police shot and killed a Palestinian after his car hit a group of Israelis standing at a train station in the Jerusalem neighborhood of Sheikh Jarrah; police fired the first bullet, which brought the driver, Abdul-Rahman Shaloudi, 20, to a halt, then fired another bullet after which he fell to the ground. Another three bullets followed and were shot at Shaloudi even though he was lying on the street, unarmed, injured, and unable to move, leading to his imminent death minutes later. In contrast, on October 19, an Israeli settler deliberately ran over two Palestinian kindergarten girls near Ramallah, killing one of them and seriously injuring the other, yet there were no reports of any police action against him. The Israeli side dealt with the incident ‘an unintentional’. On October 29, the Palestinian foreign ministry issued a statement denouncing Israel’s discriminatory treatment of Palestinians and Israelis, stressing that Israel follows an obvious discrimination policy in handling incidents committed by Israelis. Israel declares such incidents, when committed by Palestinians, as 'terror acts' without concluding proper investigations and most of the time shooting the person behind the incident at the spot, depriving him the right to defense in a court of law. Zakaria Julani, 13-year-old boy from Silwan neighborhood of Jerusalem, was treated at Hadassah Ein Kerem hospital after he was injured with a rubber bullet in his eye on March 31, 2015, when he was heading home after he got off school. According to the Wadi Hilweh Information Center – Silwan, the child’s father Yehya Julani explained that his son was injured with a rubber bullet in the eye after he left the UNRWA school and was heading home. Witness reports said that Zakaria was surprised when the snipers stationed in “Shweiki” building established across from the military crossing in Shu’fat refugee camp randomly fired rubber bullets towards the students when there were no clashes in the area; Zakaria was injured in his left eye. He added that the Israeli police arrived at the hospital to investigate the incident and confirmed that there were no clashes at the refugee camp on that date. Zakaria’s father explained that he checked the surveillance camera in the area which also showed no clashes at the time of his son’s injury. Wadi Hilweh Information Center identified two children that were injured with rubber bullets fired by Israeli snipers stationed in “Shweiki” building in the past two weeks. The first is Zakaria Julani, and the second child was an eight-year old who was injured in the head. Meanwhile on Sunday, Israeli forces broke into the village of Beit Fajjar, to the south of Bethlehem and raided and searched resident’s homes, said security sources. WAFA has been informed that a large military force broke into the village in the early morning and raided three houses belonging to three brothers, who were identified as Ahmad, Anwar and Muneer Thawabta. No arrests were reported. 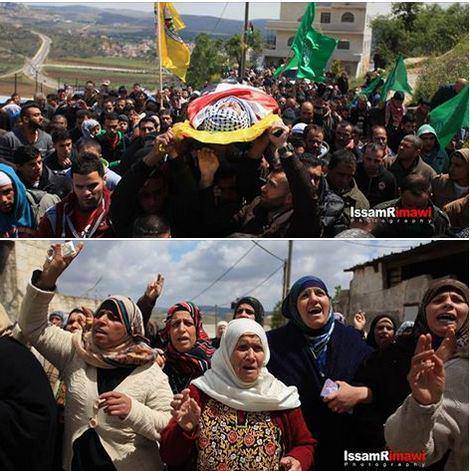 Mourners gather during the funeral of Jaafar Awad, 22, who died April 9, 2015 from health complications developed while inside Israeli jails. UN Deputy Coordinator for the Middle East James Rawley called Friday for restraint and calm within the occupied West Bank and pushed for those responsible for recent escalations to be held accountable. "As always," he remarked, "the United Nations urges that thorough investigations be conducted into these cases and that accountability be ensured." Rawley's statements come one day after Israeli forces shot a Palestinian dead in Beit Ummar, and twelve youth were injured with live fire in al-Jalazone refugee camp on Friday. Ziyad Awad, 27, was shot during clashes that ensued at his cousins funeral, Jaafar Awad, 22, who had died Friday morning from health complications that rapidly deteriorated while being held in Israeli prison. Thirteen others were injured when soldiers opened fire on mourners at the funeral. Israeli military courts rarely prosecute members of Israeli forces cases of death or injury from Israeli live fire. 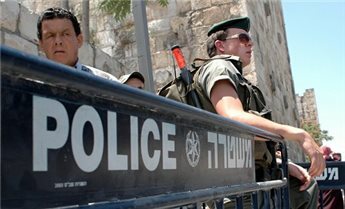 From 2000-2012, only 117 of 2,207 investigations opened by the Military Police Criminal Investigations Division were indicted, about 5% of the total files opened, according to Israeli human rights group Yesh-Din, a major factor in in the PA's decision to join the ICC. Rawley also expressed concern that the current season of religious festivity would escalate present tensions. Many Palestinian Christians will celebrate Holy Saturday and Easter Sunday this week, a time that has historically brought increased tensions in the occupied West Bank and East Jerusalem. In a report published in 2012, the US State Department highlighted Israeli policies restricting freedom of worship for Palestinian Christians and Muslims. "Strict closures and curfews imposed by the Israeli government negatively affected residents' ability to practice their religion at holy sites, including the Church of the Holy Sepulchre and Al-Aqsa Mosque in Jerusalem, as well as the Church of the Nativity in Bethlehem," the report said. "The separation barrier significantly impeded Bethlehem-area Christians from reaching the Church of the Holy Sepulchre in Jerusalem and made visits to Christian sites in Bethany (al-Eizariya) and Bethlehem difficult for Palestinian Christians who live on the Jerusalem side of the barrier." Israeli forces began firing tear gas and rubber-coated steel bullets even before Friday’s protest had begun, as the people of Ni’lin were gathering near the local school to begin their march against the Apartheid Wall and continued loss of land. The protest was initially divided into two. Israeli forces confronted protestors on one side, while townspeople were sneaking behind the military on the other side, attempting to reach the Apartheid Wall without being noticed. Once there, the Palestinian protesters, accompanied by Israeli and other international activists, gathered tinder and rubber tires, attempting to set fire to sections of the wall. The hope was that the heat created by the flames then being extinguished with water could create a rapid change in temperatures and lead to a crack in the concrete wall. Two soldiers discovered the smoke and immediately rushed to the scene, firing tear gas to disperse the protesters. Suffering from tear gas inhalation, the two groups of protesters were then forced up towards the village, were they met and reunited to continue their demonstration. 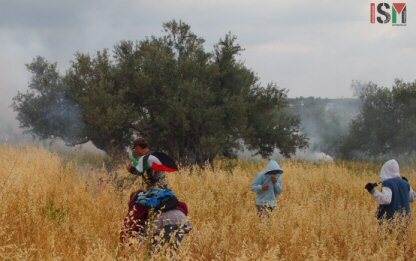 The retreat was only disrupted by protesters running into the wheat fields to extinguish a fire caused by the tear gas grenades. Israeli forces then marched aggressively towards the protesters and launched massive amounts of tear gas. One international activist reported tear gas grenades passing centimeters from her head. Occupying forces fired several rounds of rubber-coated steel bullets and protesters retreated back to a near by abandoned house, which left them somewhat entrapped, before an escape route was found. The Israeli military, with their overpowering arsenal of weaponry against unarmed protesters, successfully ended the demonstration, as tear gas grenades came alarmingly close to inhabited houses, where young children were out playing and women were doing their laundry. «We don’t want to continue our protest when it gets too close to the village, as we have a long history of soldiers eventually invading and raiding the entire village», local Palestinian activist Saeed Amireh said. «Anyway, we will be back again next Friday. Right now I’m just sorry to have heard the soldiers talking with each other in Arabic as they moved in on us», another local Palestinian activist added. Ni’lin and surrounding villages lost an estimated 40.000 out of a total of 58.000 dunums (equivalent to 580 hectares) of land following Al-Nakba in 1948, while an additional 8.000 dunums was lost during the Israeli occupation of the West Bank in 1967 and the subsequent creation of the Kirgat Sefer, Mettetyaho and Makabbem settlements. With the building of the Apartheid Wall to the west of the town and an Israeli military camp to the south, Ni’lin has seen another 2.500 dunums stolen. Together, only 7.500 dunums of land are left for the population of Ni’lin, which today inhabits approximately 5.000 people. Compared to “normal” growth rates of Palestinian cities, the population of Ni’lin should have been five times higher than it is today, but continued displacements and unemployment – which might be as high as 60 percent, according to unofficial estimates – have left the town without any significant growth since the Al-Nakba. Today, Ni’lin is threatened by an approved construction of a tunnel beneath the town, which will be running under the segregated settler-only road and replace the town`s main entrance. The main aim of the tunnel is to impose total Israeli control of movement in and out of the city, but also to further separate Palestinians from their land and to destroy the local economy. Upon completion, Ni’lin and close-by villages will be surrounded by settlements and turned into a virtual prison. Protests in Ni’lin have a long history of being met with extreme violence from Israeli forces, with the shooting of a ten-year old boy in 2008 standing out as the most striking example. Since then, several more have been shot and killed or wounded. Additionally, the repression techniques in the army have often been spraying people with a mix of weak sewage water, animal manure and chemicals known as “skunk,” due to its strong smell, with vomiting as a result. Friday’s protest left no one injured, despite the massive amount of tear gas and firing of rubber-coated steel bullets. However, evidence of Israeli violence was there, as the 16-year-old boy who was shot in the head last week was back at the forefront of the protest with a bandage around his head and a Palestinian flag in his hand. Israeli Occupation Forces (IOF) launched a large-scale search campaign in Awarta town to the east of Nablus and attacked a civilian in the process at dawn Saturday. Local sources told the PIC reporter that the IOF soldiers broke into, searched, and wreaked havoc in six Palestinian houses in the town. The soldiers beat up a Palestinian man, 39-year-old Yasser Ghazzawi, because he objected to the way they savagely broke into his house, the sources added. 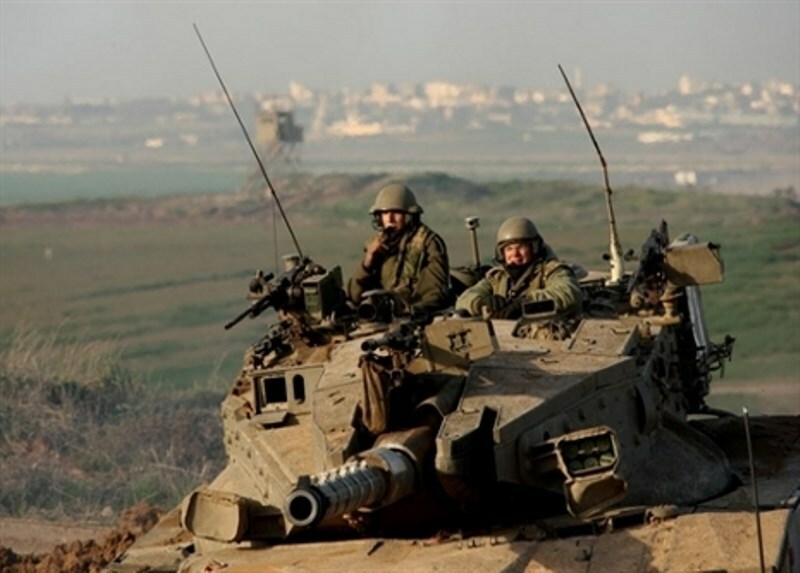 Israeli Occupation Forces (IOF) opened heavy machinegun fire at the eastern outskirts of Rafah and Khan Younis in southern Gaza Strip on Saturday. Local sources told the PIC reporter that the IOF soldiers stationed at the borderlines of the security fence fired machineguns at Palestinian farms as well as farmers east of Rafah with no casualties reported. The sources revealed that a state of panic prevailed amongst the farmers which made some of them leave their lands. 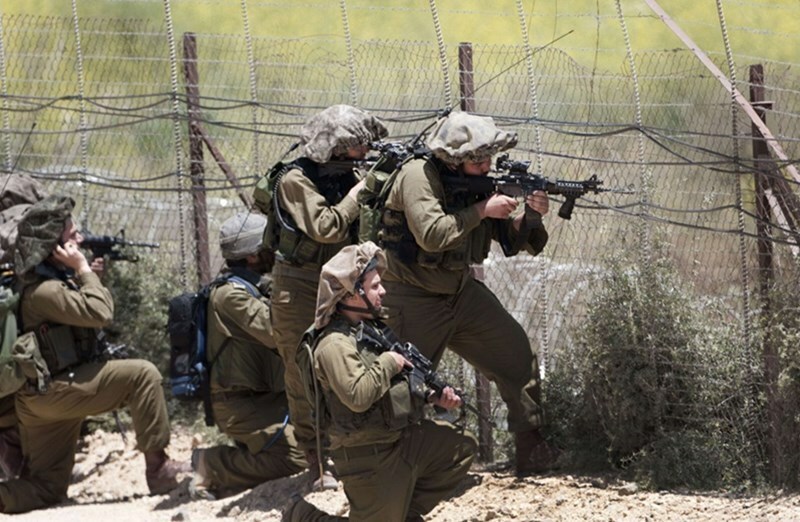 The IOF soldiers have escalated their aggressive attacks in eastern Gaza Strip. A human rights report has monitored four IOF incursions and sixteen shootings leading to five injuries and four arrests among Palestinians in Gaza only in March. The Israeli Occupation Forces (IOF) stormed on Saturday morning Beit Tamur in Bethlehem and served a summons to a Palestinian citizen for intelligence interrogation. Local sources said that IOF soldiers handed the citizen Jamal Wahesh, 45, a notice ordering him to appear before the Israeli intelligence in Gush Etzion settlement bloc. Meanwhile in another development, a number of injuries were reported during violent clashes that erupted in Aroub refugee camp to the north of al-Khalil on Friday afternoon. 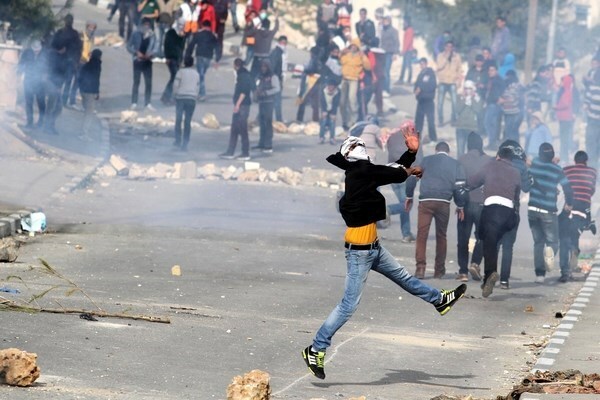 The clashes broke out at the entrance to the camp when Israeli forces heavily fired tear gas bombs and rubber bullets at local residents which led to a number of injuries and suffocation cases among them. 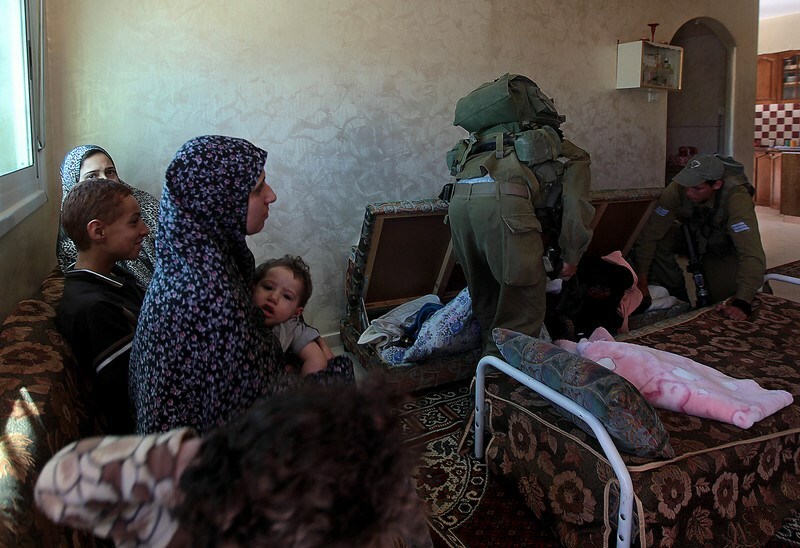 The IOF soldiers intensified their presence at the entrance to Aroub camp and occupied the rooftops of several homes.